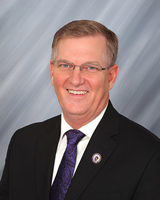 Join us Monday, back at the 5 Sullivan Brothers Convention Center, to welcome UNI President Mark Nook. He began serving as the 11th president of the University of Northern Iowa on February 1, 2017. Prior to this appointment, he served as chancellor of Montana State University Billings (MSUB). Originally from Holstein, Iowa, Nook has committed his Midwest education and values to higher education for many years and on many levels. He is dedicated to ensuring every member of the university community reaches their individual educational, professional and personal life goals. President Nook and his wife, Cheryl, reside in the UNI President's House. They have three adult children, two granddaughters and two grandsons.